Due for your annual physical exam and dreading the blood work? 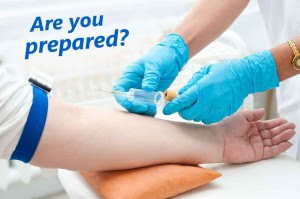 Fear of pesky needles, injections or blood draws is quite common but tests are sometimes essential for our well-being. To ensure accurate results, minimal discomfort and a smooth process here are some simple preparation tips. Tests for cholesterol and glucose require fasting. This means no eating and drinking (besides water) at least for 10-14 hours before having your blood drawn. It’s important to confirm with your physician beforehand if you need to fast. Make sure you are well hydrated. Drink plenty of fluid. This will keep dizziness at bay and also make it easier to find the veins for the blood sample. Refrain from strenuous physical exercise, smoking, and intake of caffeinated drinks before a blood draw. It can sometimes skew the test results. Unless specified, eat breakfast or a light snack. This will prevent you from feeling nauseous or lightheaded before blood removal. Don’t discontinue regular medications, unless advised otherwise. If you are taking blood-thinners or seizure medication, inform the technician before the blood test. After the procedure is completed he will observe the puncture site, to make sure the bleeding has stopped. It’s important to relax when the phlebotomist draws your blood. Don’t wiggle and fidget, as it may lead to more than one prick. If you’re nervous or anxious, avert your eyes and focus on breathing to distract your mind. Though most of us are squeamish about getting blood drawn, the process if handled by a proficient phlebotomist is short, simple and painless. Before you know it, the needle is out and the gauze plastered on the puncture site to stop bleeding. Once you’re done with the blood test, head to café for a healthy breakfast and get on with your day. Just remember to follow the phlebotomist’s instructions and not yank the bandage too soon. It might result in bruising.